This is not your ordinary side dish or entrée! It is quick and easy to make for a weeknight meal or is a fabulous side dish for a get together! I added chicken for a meal but you can leave it for more of a side dish. 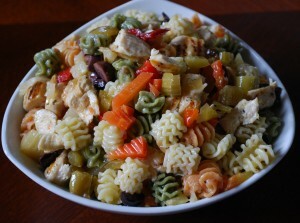 You can add more kalamata olives or grate cheese over the top as well. Also you have the choice to make it mild by using Mild Giardiniera or spicy by using Hot Giardiniera or a little bit of both for a medium spicy version. Giardiniera is a savory blend of savory blends of hot peppers, cauliflower, celery, carrots and olives packed in olive oil. (Think of it as your veggie mix to add to most anything!) It is generally used as a condiment for hot dogs, Italian beef sandwiches or as an antipasta. Serves 4 -6 as a meal or 8 – 10 as a side dish. Cook pasta per package directions. While pasta is cooking, cook or grill chicken. If choosing to grill preheat a grill or grill pan over medium high heat coat chicken breasts with olive oil and season with kosher salt and fresh ground pepper. Cook on each side over medium high heat for about 5 minutes or there isn’t any pink in the middle. Let rest on a platter. If choosing to pan fry, cube the chicken, heat olive oil over medium high heat, add chicken and season with kosher salt and fresh ground pepper. Sauté until browned. Remove chicken and add to a large bowl. Once pasta is done, drain and add to the bowl. If you are grilling the chicken cut into bite sized pieces and add to pasta. Add the giardiniera of your choice or use half of a jar of each. Stir to evenly coat and serve warm or chilled.